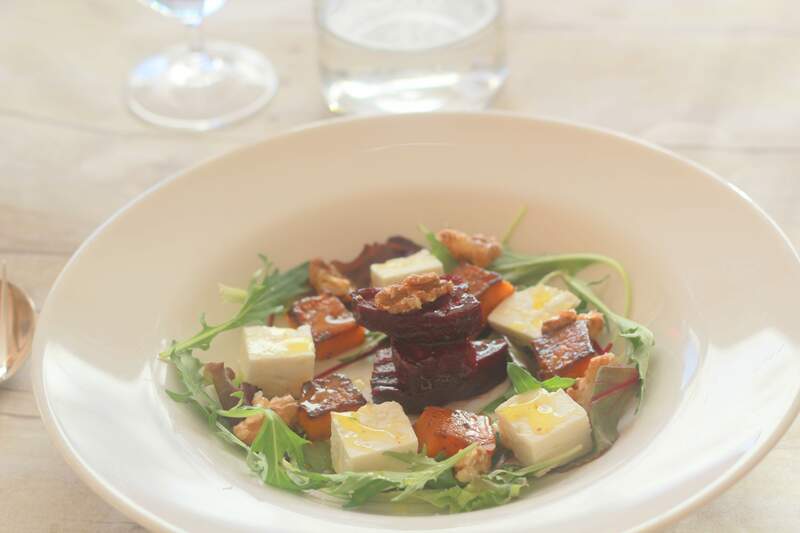 Check out this delicious winter salad for a hearty lunch or a delicious first course. Serve this luke warm rather than cold and it is just YUM. The caramelised walnuts are the perfect counterfoil to the beetroot and feta so don’t omit this step. Full of great antioxidants and vitamins from the veggies never mind the Omega 3 fatty acid boost from the walnuts and good oil fats. Beetroot in particular is great for Heart Health so what’s not to ♥. 1 small butter nut squash peeled and chopped into 2” pieces (if very big, just use the long end). Roast the beetroot until tender. (About 15 minutes) (Remember to use disposable plastic gloves when peeling and chopping if you don’t want purple hands). Heat some oil in the pan over a medium heat and add the butternut squash. Season and cook until the underside is golden brown and lovely and caramelised. Put pan into the oven to finish cooking – about 8 minutes. Clean the pan and place back on a high heat. Add the sugar and let it caramelise, as soon as this happens, tip the walnuts in and stir around quickly to coat them in the sugar. Tip them into a bowl when caramelised so as not to burn. Arrange the beet, squash and feta on a plate and add the mixed salad leaves. Toss over the candied walnuts, drizzle over some simple vinaigrette and serve and enjoy!.